N.R. 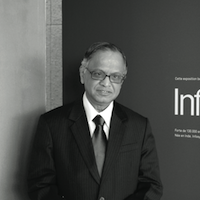 Narayana Murthy is an Indian Industrialist and software engineer. He and six other engineers co-founded Infosys in 1981. Murthy served as CEO from 1981 to 2001. From 2002 to 2011, he served as chairman. In 2011, he stepped down from the board and became Chairman Emeritus. He is now known for this work on corporate philanthropy in India. Murthy has dedicated a huge amount of time and money to help his country and the people. He has said that developing countries need philanthropy more than developed nations for a simple reason: there are lots of poor people and the Government cannot do too much because of its limited resources. He therefore feels that it becomes the responsibility of the civil society and the corporations to add value to the efforts of the government by making sure that the society becomes better, be it through educational initiatives, healthcare initiatives or nutritional initiatives. "N.R Narayana Murthy is involved in numerous charitable causes and associations. He serves on the boards of the Ford Foundation, the UN Foundation, the IndoBritish Partnership, a trustee of the Infosys prize and as a trustee of the Rhodes Trust. He is chairman of the governing board of Public Health Foundation of India. In November 2006, TIME magazine voted Murthy as one of the Asian heroes who have brought about revolutionary changes in Asia in the last 60 years. The list featured people who have had a significant impact on Asian history over the past 60 years and it included others such as Mahatma Gandhi, Dalai Lama, Mother Teresa, and Muhammad Ali Jinnah."